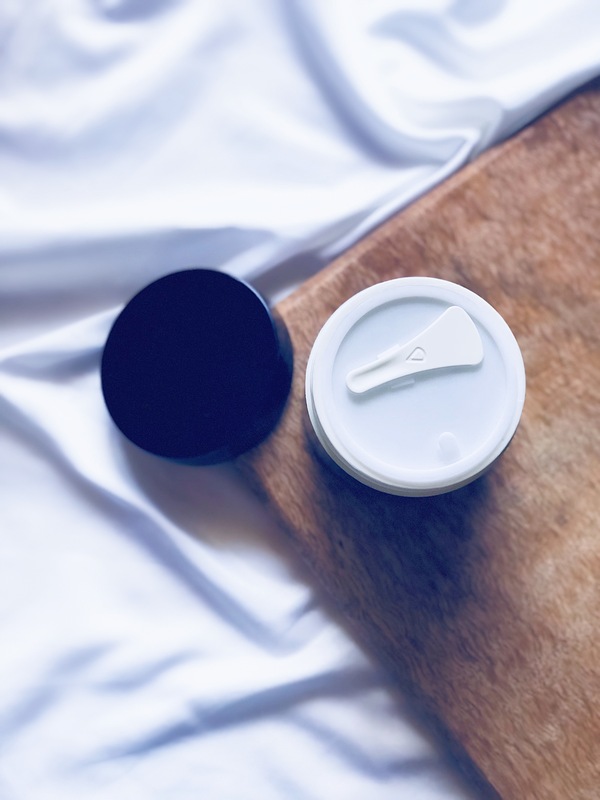 Today I’m bringing to you a review of the AHC Premium Hydra B5 Sleeping Pack, one of the kbeaty sleeping masks that I bought from Sasa a while ago on my Honk Kong trip. I’ve used it a bunch since I got it and honestly feel this product deserves a review…so here we go! 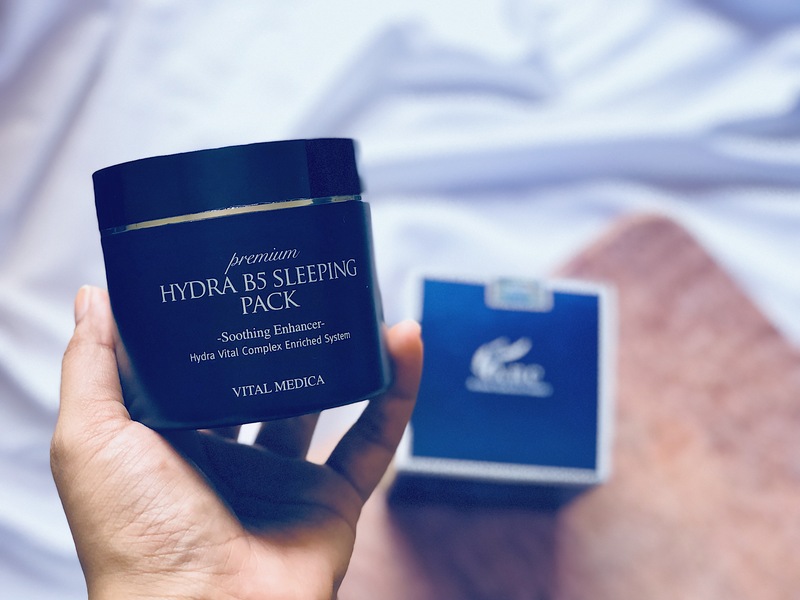 AHC stands for Aesthetic Hydration Cosmetics and the AHC Premium Hydra B5 Sleeping Pack is a hydrating and moisturising sleeping mask that is enriched with the goodness of Sodium Hyaluronate to moisturise your skin. This Sleeping pack targets Brightening & Wrinkle Care, along side hydrating your skin to the deepest level. 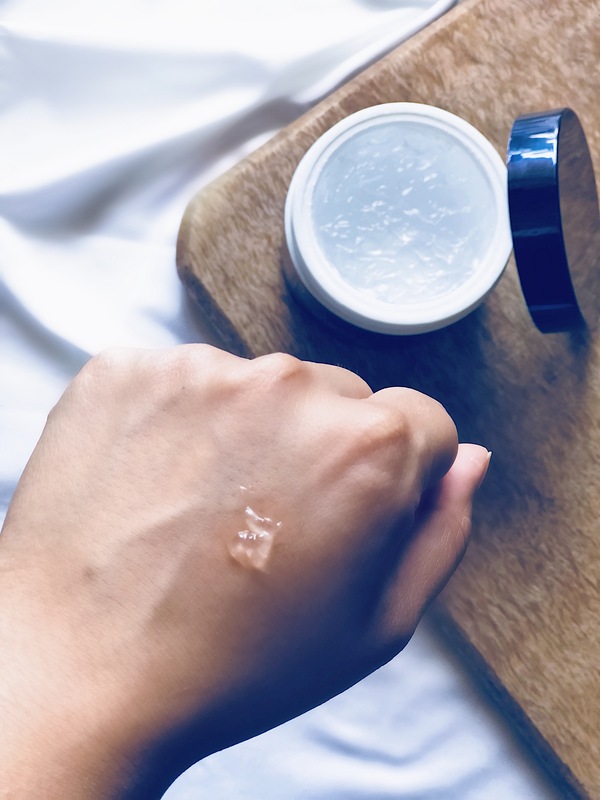 Now if you don’t know what sodium hyaluronate is, it is basically the sodium salt in hyaluronic acid and has a much smaller molecular size than Hyaluronic Acid and what that means is that it can penetrate into the deeper layers of your skin. When you apply Sodium Hyaluronate topically, it reaches deep into the skin and not only maintains moisture content in the skin but also attracts more water into the skin from the environment, promoting nutrient absorption and blood microcirculation to help maintain the skin’s normal metabolism. The results you ask? – Softer, smoother skin with a fuller appearance and decreased wrinkles! 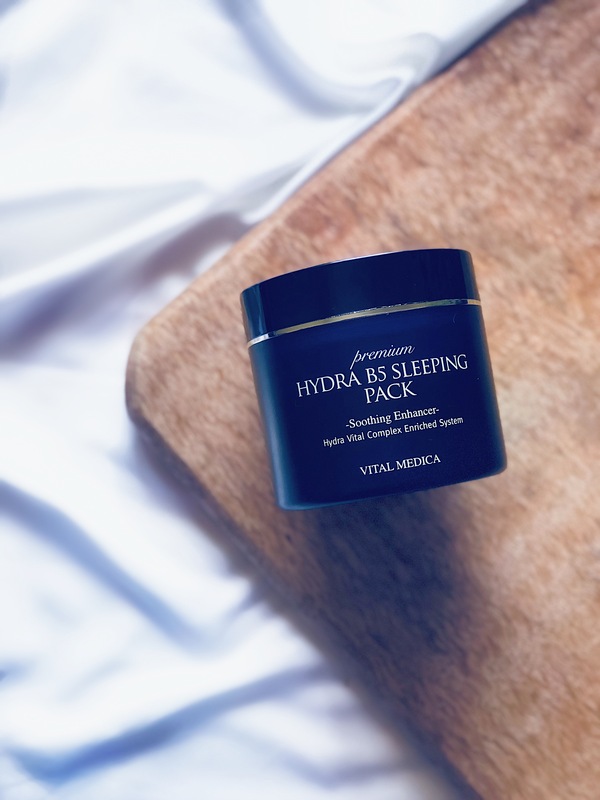 The AHC Premium Hydra B5 Sleeping Mask also contains more star ingredients, some of which are Vitamin B5 (to restore damaged skin), Licorice Extract and Aloe (to soothe the skin), Birch Tree Sap (to reduce inflammation and purify skin), Panthenol (to reduce inflammation, promote healing and reduces transepidermal water loss) and Hydrolyzed Collagen to improve skin elasticity. Now that we know the ingredients, let’s talk about the actual product. 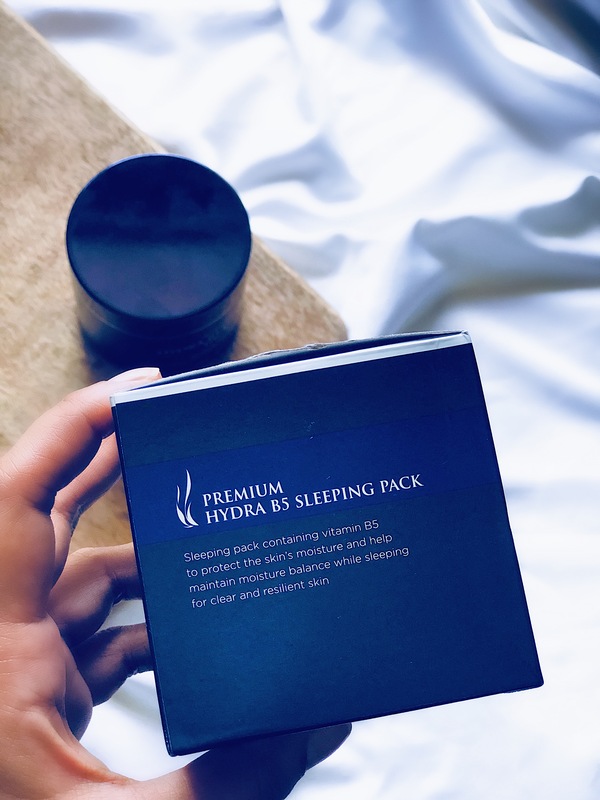 I’ll start with the Packaging – the AHC Premium Hydra B5 Sleeping Pack comes housed in a dark blue plastic jar container with a screw top lid. It has very basic packaging, but I appreciate that once you open the jar, there is a plastic lid that covers the actual product, which means it’s not going to get everywhere on the lid if you happen to travel with it or leave it upside down. Also, there is a white plastic spatula for scooping out product, so you don’t have to dip your fingers into the jar. Next, let’s talk Texture – As you can see from the pictures, it is a clear, gel-like mask. The consistency is not too thick and once you scoop out the product and rub it in between your fingers, it has a very interesting texture – a mix between silicone-y and watery. Also, it has a very mild and pleasing scent – nothing overpowering and it doesn’t linger on the skin. 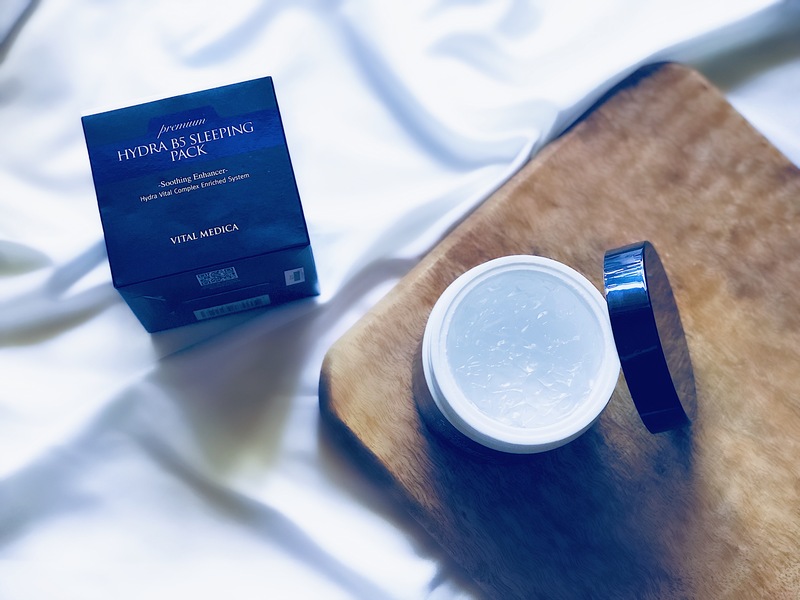 Coming on to my first Experience of using this mask – The first sleeping mask I ever tried was the Laneige Water Sleeping Mask, one that is coveted and raved about by everyone in the beauty community (and their mothers! ), so when I used the AHC Premium Hydra B5 Sleeping Pack I was a bit disappointed the minute I applied it. 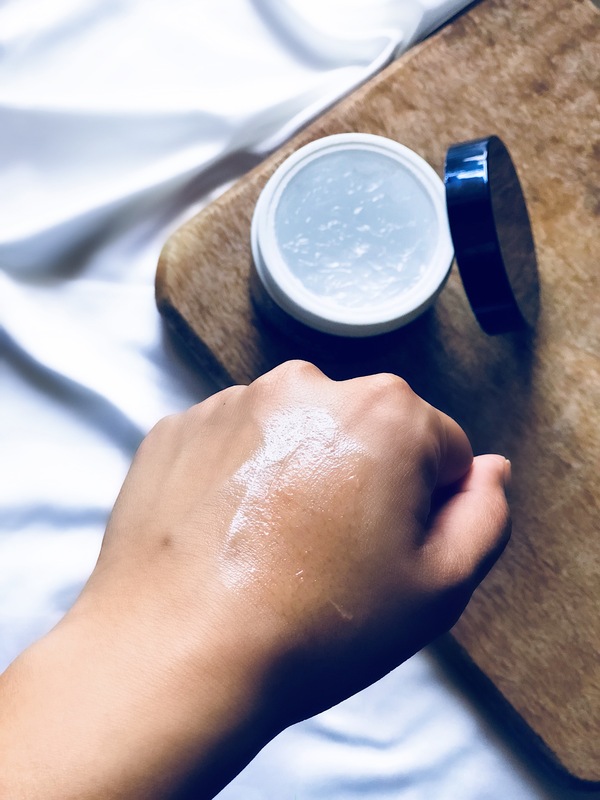 Now hear me out – I said ‘the minute I applied it’ and that’s because the texture and how this sits on the skin is very different from the Laneige water sleeping mask (the one that I had been using previously to this). 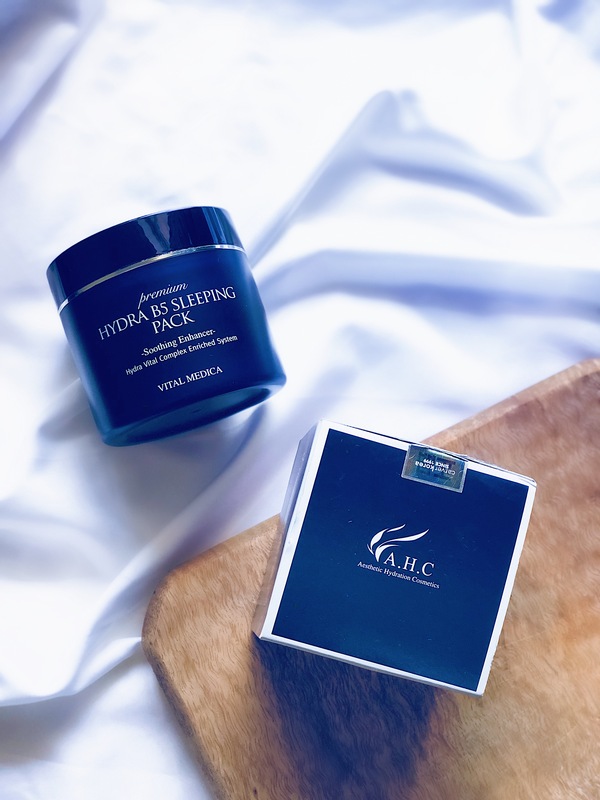 The AHC Premium Hydra B5 Sleeping Pack has a silicone-like texture and sits on top of the skin for a few minutes, whereas the Laneige sleeping mask is more of a serum texture and gets absorbed into the skin almost immediately. 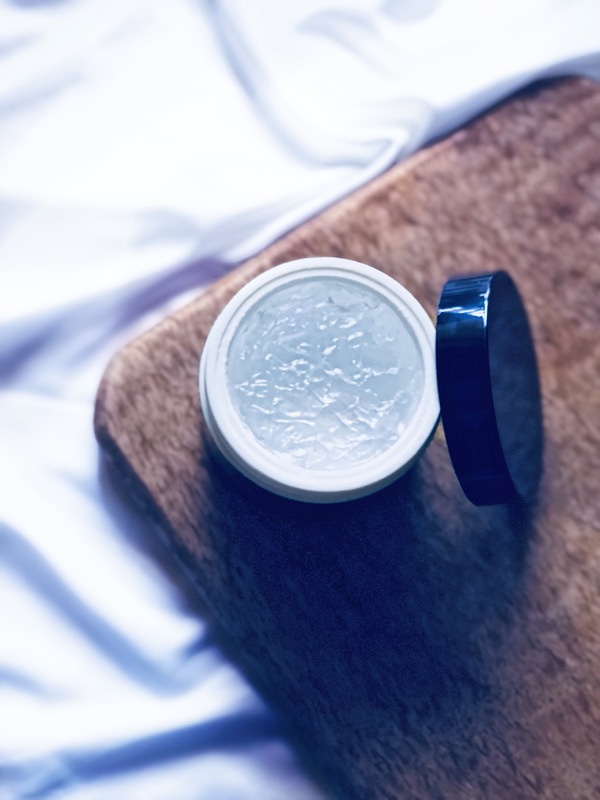 When I first applied the AHC Premium Hydra B5 Sleeping Pack I kept trying to massage it into the skin like a moisturiser, but it kept slipping and sliding around my face. 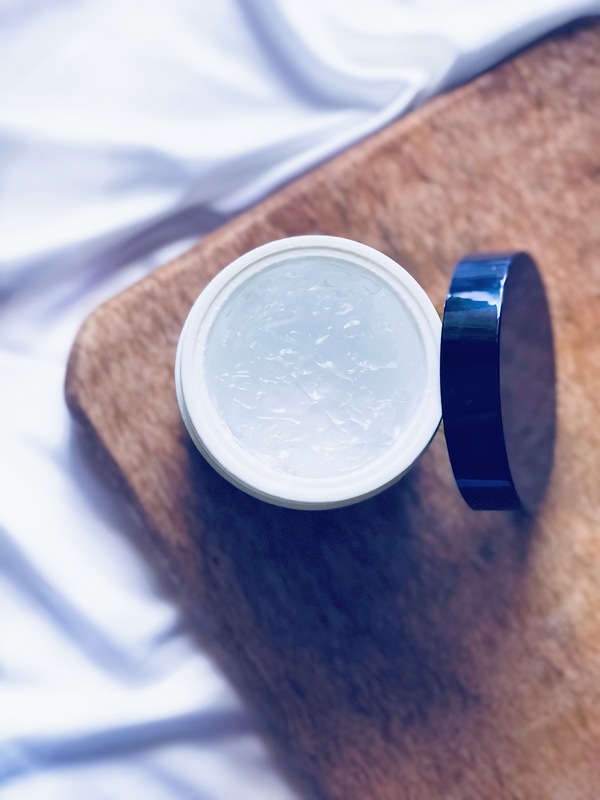 It felt a tad bit heavy and sticky on the skin, BUT – 15 minutes later when I touched my skin it had just absorbed all of the moisture from this mask and my skin felt more firm and tight. The second time I used this mask, I fell in LOVE with it! I recommend applying a thin layer of the mask all over your skin and letting it just sit for few minutes. It would be great if you can apply it half an hour before you go to bed because that way it will have enough time to completely soak into your skin. As per CosDNA, the AHC Premium Hydra B5 Sleeping Pack does not show any major red flags. I usually use a sleeping mask twice or thrice a week, depending on how my skin is feeling and what it needs. So I like to apply this as the last step of my night time skincare routine and I scoop out a pea-size amount of the product and rub it in between my fingers to melt it. Then I apply a thin layer of it all over my face and neck and massage it into the skin for a few seconds. Because this is a sleeping mask, I go to sleep without rinsing it off and the next morning I just wash my face with some water. Moisturises Skin Deeply: Thanks to the Vitamin B5 and Sodium Hyaluronate, it keeps the skin moisturised and combats dryness. Vitamin B5 also enhances the skin’s ability to repair itself. It helps provide intense hydration to the skin overnight and I wake up to radiant, supple skin the next morning. Soothes the Skin – Trehalose, which is a cactus derived ingredient helps to lock in the moisture in your skin by creating a protective barrier/film on the skin. Enhances Skin Elasticity: The mask also contains the goodness of hydrolyzed collagen, which effectively smoothens rough skin and makes the skin more radiant by reducing the size of pores and restoring the moisture balance of the skin. 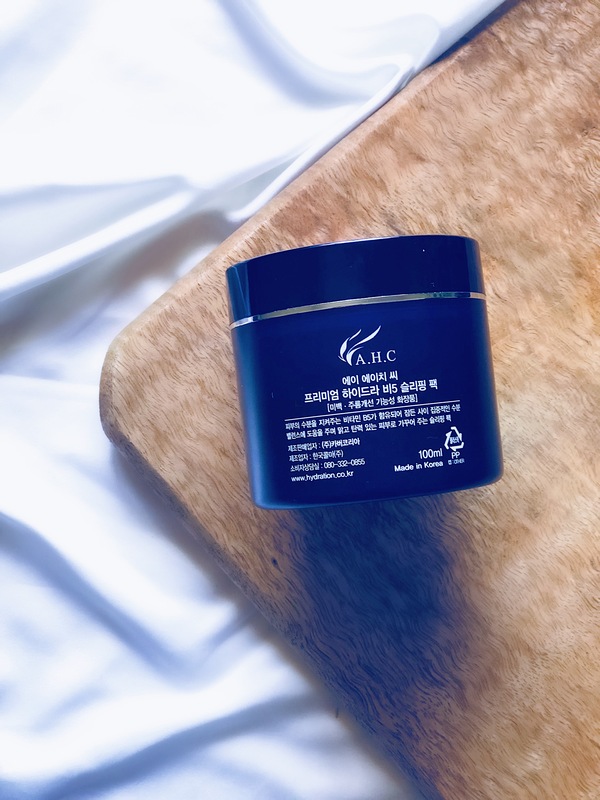 Anti-ageing and Anti-inflammatory: The mask is packed with extracts that work as antioxidants and anti-inflammatory ingredients and protect the skin. These ingredients also help to prevent your skin from ageing prematurely. Helps maintain the oil and water balance in the skin. The Water Drop formula is so interesting. The particles release moisture and form a hydrogel protective layer over the skin. Thank you soooooooooooooooo much for your kindness. it help me to consider continue to used it. I honestly love this product so so much!